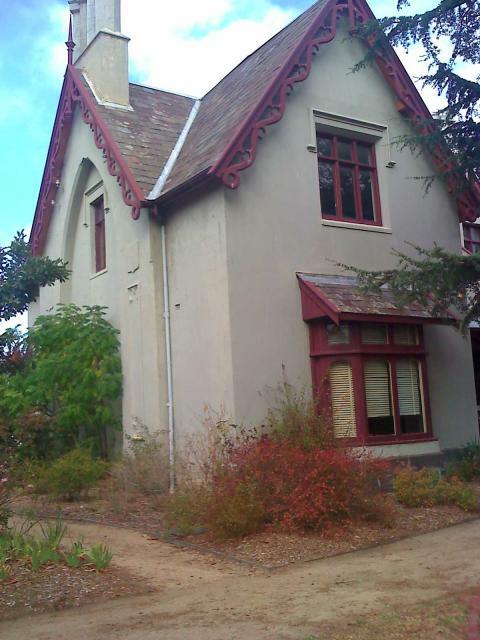 Last night, Overland poetry editor Keri Glastonbury presented the results of the Overland Judith Wright Poetry Prize for New and Emerging Poets, at a function jointly hosted with the Australian Poetry Centre at the historic ‘Glenfern’ property. Thanks to everyone who attended, all the poets who entered the competition, and to the Malcolm Robertson Foundation for making the whole prize possible. The major prize was awarded to Tim Wright. His poem is available in the newly released Overland 194, which can be purchased here. You can read Keri’s judge’s report here. The other winning poems will be published in forthcoming editions of Overland. The Overland Judith Wright Prize is intended as annual event. If you think it’s an initiative worth backing, the best way to show your support is by becoming a subscriber. Congratulations to all the winners, looking foward to reading their work. As a poet who has never submitted poetry to Overland or entered the Judith Wright prize, I do think there should be more (open) dialogue about Overland’s poetry section within the wider poetic community. Do you have any particular thoughts on it? Keri does read this blog, I think. Well, I don’t have anything particular in mind. I don’t submit to many poetry journals, despite the occasional request. …but I guess I was just generally wondering why I don’t submit poetry to Overland in particular when I buy/subscribe to the publication. The best I could come up with is that I haven’t seen poems ‘like’ mine published in Overland in the time I’ve been reading the journal… I think that’s a bit the way with poets – there’s a sense of ‘they don’t publish poems like mine, poets like me, so why waste my time?’ And then it all becomes a bit chicken and egg. I feel the poetry sections of many Australian literary journals seem to fall behind a particular ‘poetry/language school’ and there is sometimes a sense of ‘same, same but different,’ which is frustrating. of course, i’ve always been a little suspicious when journals ask writers to familiarise themselves with the type of material they publish before submitting. i try not to submit to journals based on whether or not my style will suit, whether they’ve published poems ‘like mine’ in the past. having said that though, i only sent poems to overland after keri became editor. mainly because i believe in what i think is her ideal, that of getting new voices into the poetry publishing arena, into the conversation. so, i think you should submit your work maxine. I agree with Derek. You should submit your work everywhere you have time to, Maxine. It could never be rejected because it wasn’t good enough, only because it didn’t accord with the editor’s aesthetic. If we all did that and compared notes we might be able to figure out what was going on. At the moment I’m only submitting to magazines with a ‘blind’ editorial policy (i.e. 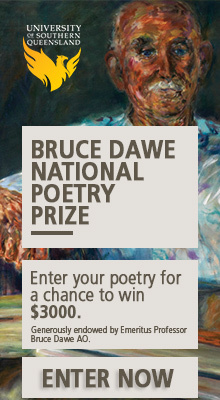 where the person who selects the poems doesn’t know who wrote them), which is a policy I think poets should encourage. You’re right Paul, I think there’s a lot to be said for ‘blind’ editorial policy. Jeff, call me Devil’s Advocate, but in a previous post, you said the one thing you would ask of people submitting to Overland was that they are familiar with the journal. Is that less the case with poetry submissions, and how, if at all, does that affect Derek’s above comment about homogeneity. Are submissions to Overland (particularly the poetry section) pretty much constant, or do you find the submission level wavers depending on say, what kind of work has been published in the magazine over the last twelve months? Is it just Overland’s political leanings you want writers to be familiar with? Muchos Grachos to all the readers at the JW Prize event: Tim Wright, Astrid Lorange, Aden Rolfe and Briohny Doyle. It was a great way to finish the process; the levity and grace of the readings gave flesh and form to what had been a huge anonymous pile of paper. Listening to the poems allowed them so much more inflection, as of course judging the award was limited by my own reading processes and practices (let alone thresholds). For example, I really enjoyed Briohny’s reading of her poem “Old Town”, which she’d entered in the competition but which wasn’t even shortlisted. Interestingly, she said afterwards that it was one she’d written primarily for performance rather than the page. The JW award was ‘blind’, but as I ended up knowing all bar one of the poets, it felt more like a psychic exercise. Perhaps blind editorial processes still don’t tap the substratum of sensibility. That said there was a diverse range of styles in the winner’s circle: Verse novel, allegorical prose, monologue, the surrealist image as well as various forms of ‘post-avant’ lyric (which I suspect may be seen as my Overland signature style). I hope to publish all the shortlisted poems, either in the magazine or on-line, to show this diversity. If I do have an agenda as Overland poetry editor it is to publish the work of poets who aren’t necessarily familiar names in literary journals (at least in print). I’m just as likely not to accept poems by established writers (that I don’t think stand up) despite knowing their reputation, as I am emerging or unknown poets. And I agree with Paul: if your work is not accepted, this says more about me than you! All I can do is make sure I hand over the reins before I instate too much of an alternative orthodoxy! Congratulations again to all the Judith Wright winners and commended poets. It’s a great community to be part of and privy to.